I was fairly excited to read this novel - it had a great cover, a fabulous premise, and lots of my blogger friends had read it. I figured it was the perfect thing to read on my Kobo while my mother and I vacationed at the Library Hotel in New York City (I saved my paper copy of Anne of Avonlea for take-off and landing). Imagine my surprise when I found myself scrolling through Twitter and perusing articles on my phone in the Library Hotel's reading room rather than actually reading the book that I'd brought. 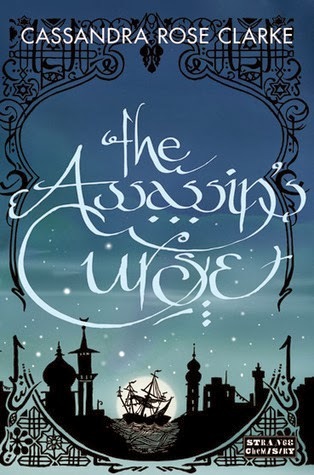 Yes, The Assassin's Curse is that boring and stupid. So our heroine Pineapple - I'm sorry, Ananna - is the daughter of prominent pirates who is about to be married off to the son of other, equally-prominent pirates. All is well until Pineapple suddenly goes, "DO NOT WANT" and impulsively flees on a camel. Because why not? Unfortunately, her ex-fiance's Pirate Parents are not pleased with her marriage-dodging camel shenanigans and send a Magical Assassin after her. Thankfully, the Magical Assassin (named Naji) is Terrible At His Job and almost gets bitten by a poisonous snake while attacking Pineapple. Thankfully, Pineapple is Terrible At Everything In General and kills the snake for no other reason than she's a Heroine and has to save the man trying to murder her because the plot wills it. Unfortunately, this unleashes a curse which means Naji has to serve, protect, and remain in her vicinity at all times or else he feels excruciating pain. Which turns out to be super-convenient as Pineapple's Pirate In-Laws have sent other Magical Assassins after her, and some Evil Dudes from an Alternate Dimension are also after Naji for Reasons Unexplained. Oh, and this bitchy river witch whom Naji used to bone is also involved. Everything's written in this dull, arbitrary style - "of course the heroine's a pirate, and of course this must happen because this is what Feisty Heroines Do" - and it doesn't help that the heroine is a moron. She cuts herself off from her entire family and way of life on a moment's whim then acts surprised that her actions have actual consequences. Flawed heroines are great and realistic and all, but I couldn't empathize with this aggressively idiotic scatterbrain for longer than 100 pages. Her character didn't feel organic or well-realized - she came off like a checklist of Feisty Heroine Traits that had all been checked off at once. I felt the same way with Naji - he was just filling out his quota of Angsty Hero Traits (angsty scar? Check! Refusal to tell the heroine anything for her own good? Check! Bad manners? Check! Bitchy ex? Check!) The whole story seemed to run on cliches and aimed for all the major points in a Teen Fantasy Novel - oh look, here's the scene where the heroine dislikes the hero's ex and feels ugly by comparison; here's the scene where the hero refuses to tell the heroine the whole truth and this gets them both in trouble; oh look, the heroine has Super Special Magical Powers she never knew she had! ugh, again? By that point, I was tired of Ananna's quippy sarcastic narration and Naji's Brooding Scarred Angst, and had no real interest in following along with their adventures. So I moved on to something else. The premise of this looks pretty fantastic! What a bummer dumb characters ruin it - I think that's the saddest thing that ever happens to a book. Yeah. Mostly I think the plotting was just too haphazard for me.